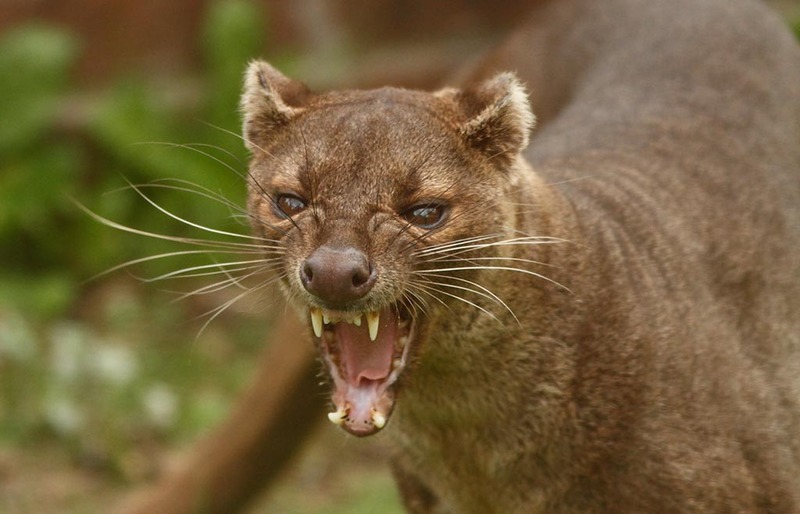 The fossa is a cat-like, carnivorous mammal endemic to Madagascar. It is a member of the Eupleridae, a family of carnivorans closely related to the mongoose family (Herpestidae). Its classification has been controversial because its physical traits resemble those of cats, yet other traits suggest a close relationship with viverrids (most civets and their relatives). Its classification, along with that of the other Malagasy carnivores, influenced hypotheses about how many times mammalian carnivores have colonized Madagascar. With genetic studies demonstrating that the fossa and all other Malagasy carnivores are most closely related to each other (forming a clade, recognized as the family Eupleridae), carnivorans are now thought to have colonized the island once, around 18 to 20 million years ago. The fossa is the largest mammalian carnivore on the island of Madagascar and has been compared to a small cougar. Adults have a head-body length of 70–80 cm (28–31 in) and weigh between 5.5 and 8.6 kg (12 and 19 lb), with the males larger than the females. It has semi-retractable claws (meaning it can extend but not retract its claws fully) and flexible ankles that allow it to climb up and down trees head-first, and also support jumping from tree to tree. The fossa is unique within its family for the shape of its genitalia, which share traits with those of cats and hyenas. The species is widespread, although population densities are usually low. It is found solely in forested habitat, and actively hunts both by day and night. Over 50% of its diet consists of lemurs, the endemic primates found on the island; tenrecs, rodents, lizards, birds, and other animals are also documented as prey. Mating usually occurs in trees on horizontal limbs and can last for several hours. Litters range from one to six pups, which are born blind and toothless (altricial). Infants wean after 4.5 months and are independent after a year. Sexual maturity occurs around three to four years of age, and life expectancy in captivity is 20 years. The fossa is listed as a vulnerable species by the International Union for Conservation of Nature. It is generally feared by the Malagasy people and is often protected by their fady (taboo). The greatest threat to the species is habitat destruction.